Kimberley Caines-Best has been appointed to serve on the Bermuda Airport Authority’s Board. The announcement said, “Minister of Tourism and Transport Zane DeSilva has appointed Barrister and Attorney Kimberley D. Caines-Best to serve on the Bermuda Airport Authority’s Board. She has also been appointed to the Board’s Governance and Strategic Initiatives Committee. “Called to the Bar of England and Wales in 2010 and the Bermuda Bar in 2011, Mrs. Caines-Best is a member of the Bermuda Bar Association and the Honourable Society of Lincoln’s Inn. She is a Notary Public and a Blackstone Fellow. “Mrs. 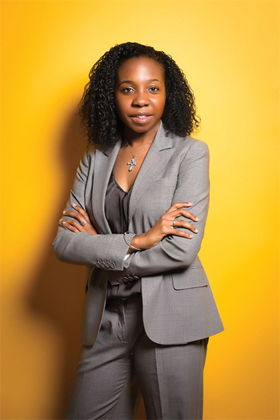 Caines-Best began her legal career in civil litigation with a local firm where she worked for seven years before transitioning to a financial institution as Legal Counsel. She has been in her present position for approximately two years. “Mrs. Caines-Best completed her education at the University of Western Ontario, where she obtained a B.A. [Hons] in Women’s Studies and Spanish Language and Literature. She obtained her LL.B. [Hons] and completed the Bar Vocational Course at the City Law School. “A former chairperson of the Devonshire Parish Council, and a former member of the Bermuda Road Safety Council, Mrs. Caines-Best presently serves as a Board Member on the Bermuda High School for Girls Board of Trustees. hope she knows more about Bermuda Airport than DeSilva does. Seems like a very intelligent young woman from her credentials I should see why not. But instead of giving credit to the young lady, you want to be an @$$#0£€ and insult her. OBA trolls are PATHETIC !!!!!!!!!!!!!!!! He insulted Desilva, not her you moron. Typical idiotic zealot. Wow are you that dumb that you cannot tell who is being ridiculed? Very strange. Hundreds of people are appointed to government boards. Why does this particular one merit publication? There was also an article a few weeks ago about her distributing school supplies with her church – again the type of ordinary charity activity hundreds of people engage in. Is she planning on running for parliament in the near future?